Discussion in 'Community Events' started by JonoStan96, Mar 12, 2019. What an amazing race that was, Keeden and I had an absolute blast. Took a gamble and chucked the slower driver in first (which was me, duh), and it was white knuckle stuff, epically close racing while Tyson bolted off. Mint was cartoonishly slow down the straights and miles off his pre race pace so he was a sitting duck unfortunately. The GT wasn’t particularly zippy either and it made passing very difficult indeed during the great battle with the TCX cars. We had a quick car in clear air though, so we went long to try and give us some breathing space before handing over to Keeden. Keeden soon passed XL and Hat in a tricky stint but it brought us right into play. It was still anyone’s race with Motors going ultra long, Vardz going very fast and Tyson and Austin on their different strategy. With one hour done it was my turn again. This has to be one of the best stints I’ve ever driven, the car felt amazing and I was able to rack up 11’s on every lap, and caught Austin. I lost about 7 seconds battling him which proved to be crucial. I was now catchng Tyson who seemed like he wasn’t lapping anywhere near the sort of pace he had in the first stint. With about 28 minutes left my race was done and Keeden had to bring it home. To our surprise we overcut Tyson and Austin fairly comfortably. Keeden was wary of the threat from behind but on cue harnessed the alien power only he has and began racking up some insane lap times to pull away. Motors was in the lead on his 2 stop strategy with Vardz catching him at a rate of knots. Keeden gave it his all but couldn’t carch Vardz before he got past Motors. The win was now out of reach and time was running out fast. Motors looked like he was struggling big time on old front tyres and on the last lap, Keeden sent it around the outside of Murray’s Corner and pulled the move off for a stunning 2nd place finish. Easily one of the most exciting races we’ve been a part of. Huge congrats to Vardz for getting the win that he’s threatened to do for a long time. Congrats to Motors as well for winning the TCX class. Easyprey007, Motors560, VARDZ and 4 others like this. You're welcome on letting keedy passed after vards finally got by me, Jono. Feeling the aches after karting yesterday and 2 hours around Bathurst last night. 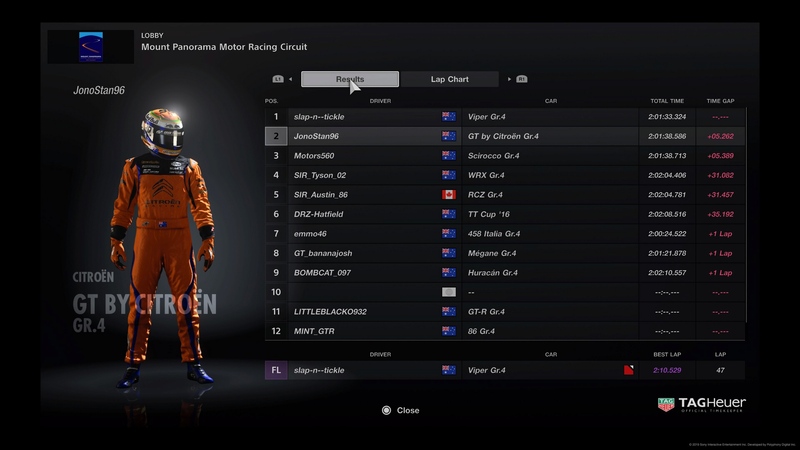 Had a fairly lonely run to 7th and was disappointed to be classified a lap down even though I was only half a lap down. Just the luck of the timing with the two hour mark coming up after the leaders had crossed the line and I hadn't. Unfortunately carried damage for all but about 3 laps so wasn't able to get anywhere near my qually pace which was off the leaders pace anyway. Still enjoyed the run though. JonoStan96 and KeedenMcdonald like this. Absolute stoked as you can imagine. Firstly to Jono and the band of helpers that BOP the cars for the WET series you do an awesome job and to those that whinge and bleat like 12 year olds… I am not going say a word to you but what I will say is this series wouldn't see someone like me who is a lower div driver compete and battle with the best the community has within it. To have a chance to podium in this company will keep me coming back. I may have been able to set times in the 10's last night (4 of 54 laps, I counted them) but most of the lap time I set were in the 11's and 12's as I wont be consistent enough to nail 10's lap after lap. Started on row 2 behind @Toranafan-02 on the pole and made a stupid error of trying to launch in 4th and was swamped by the chasers. Managed to grab 3rd back up mountain straight but when I over run the entry to the esses I smacked the wall and left @MINT_GTR no where to go... sorry mate. So damaged on front and rear had me thinking do I stop and repair or do I hang on there for a bit and see where I am at in a few laps. 5 laps down the road I had managed to get away from the squabbling pack of mint, Austin, @JonoStan96 and @Motors560 by 2 secs so I stayed out and set about try to close the gap to @Hatfield which was 2 secs also. By lap 9 I managed to get up to hat but it took 2 laps to get past the very wide TT on the outside of the chase. During the battle the chasing pack had closed the gap. So on to my second stop on lap 29... No damaged sustained on that stint..TICK 14 laps of fuel on board(86%) to get me to my next scheduled stop at the end of 43. I re-join in 5th 5 seconds adrift of Austin. Keedan pits on the next lap and re-joins 7 seconds behind me and ahead of me are the team mates about halfway through their stint so the rubber would have been on the side. I am on fresh rubber and have some clear air in front of me.... LETS GO!!! LAP 31 Sector 1 purple, Sector2 purple, Sector 3 purple and my first 10 for the night. Lap 32 and think to myself be patient don't go diving into a gap that doesn't exist. Lap 33 and I get a run out of Forrest elbow and get the pass done before the kink on Tyson, he doesn't give his spot up easily... contact in the chase but I hold my ground and get the pass done Lap 34 Austin runs slightly wide at Hell and get the pass done by the hump on mountain straight. The gap to Motors is 12 seconds, I am on rubber that is 5 laps old and just over half a tank of fuel v his rubber has done 15 laps and would be seriously second hand. This is confirmed as 2 11 flats sees the gap close by 5 seconds... Motors reacts immediately and pits at the end of lap 37. I inherit the lead of the race and the gap is 6 seconds to Austin and intend on setting out to my scheduled stop at the end of lap 43. Lap 38 BUGGER!!!! I hit the wall on the way down the mountain... the damage is costing over a second a lap so I decide there to stop early end of lap 40. I managed another than I had planned originally so I stopped at the end of lap 41. Lap 42 I rejoin 7 secs behind motors and 23 secs behind Jono and Keedan (KENO) I was safe in the knowledge that they need to pit again so I set off after Motors on fresh rubber. Lap 43 Gap to Motors is 6.5... KENO re-joins 6 seconds behind me. Lap 44 Gap to Motors is 7 secs...he has responded I am a little dejected and think 2nd is still a good result. Lap 45 gap to 5.5 after an 11 flat. Lap 46 gap is 4 seconds now after I manage a 2nd 2'10 second lap for the night. I am on a mission now!!! Lap 47 and I set purple sectors all the way around and manage my FL for the night at a 10'529. Lap 48 and I all over motors now. During testing I found the sweet spot of tyres/fuel was laps 6-10 of the stint so again I needed to be patient. Lap 50 and the opportunity is there on the exit of the chase, I make the pass stick on the outside of final turn and have the pass done by the start finish line. Lap 51 and on the way up the mountain I am flashing bombcat as somewhere in the next lap or so I will be putting him a lap down. Off of Skyline and Into the Esses he brakes at what would have been his normal spot I can only assume, but it is along way earlier than my braking point and I make contact with him. Now I will give him the benefit of the doubt as he may not have seen me flashing him to get out of the way or the blue flags being waved or the message that pops up that says Blue Flags but he manages to get out of the way at the elbow and Motors and I both get past with gap between us only a car length or so. So I set sail for home and manage to build a gap over the remaining 3 laps. All this time KENO is lurking …. lurking waiting to pounce. let me just say the pass to get Motors on the final lap on the front straight is worth a look. KeedenMcdonald, Motors560, Hatfield and 3 others like this. I am envious that you had a great battle at the front. I wasn't quick enough to keep up but it was still a good race. I enjoyed driving the Fezza. I had it painted in the Scuderia Veloce colours from the Ferrari 250LM that they ran at a couple of Easter Bathurst events in the 60s.